Juicy tropical hues have me inspired this season. Summer is the time to stow away those neutrals and make room in our closets for those bright and bold styles that lift our moods and make heads turn. From cherry red and aqua blue to lemon yellow, it’s time to embrace the rainbow. When your parents are Johnny Depp and Vanessa Paradis, it’s pretty much a given that you are going to grow up to become a flawless specimen in terms of beauty and style. Now, at age 17, Lily-Rose Depp has developed into quite the fashion icon. The teen beauty is now an actress and model in her own right and her effortless, 1960s flower-child meets Parisian mademoiselle style has earned her the title of muse for powerhouse designers like Karl Lagerfeld. I don’t know what everyone else was doing at seventeen, but I certainly wasn’t bumping elbows with couturiers or wearing Chanel (I was working at Dairy Queen and hanging out with my friends in Home Sense). That beauty. Those parents. That bone structure. There’s a million and one reasons to envy Miss. Depp. Her rad style is just one reason to girl crush on her. The choker is majorly trending this season and is a favorite of Lily-Rose. This outfit pays homage to the 60s with her colorful, psychedelic printed top and high-waisted denim. Re-create the look with a similarly printed tube top and your trusty vintage jeans. Cap it off with a thick choker in a clashing color. Don’t have one? Tie a ribbon around your neck to emulate Lily-Rose’s own version. At such a young age, Lily-Rose has already established herself as someone who refuses to follow fashion conventions. At Cannes 2016, she wore a flowy, bohemian dress from Chanel with a sultry cutout to reveal her impressively toned tummy. Take a page out of her book and wear a similar sheer maxi skirt with an off-the-shoulder crop top for a look that is elegant with just the right amount of sexiness. Reminding us all of her young age, this look is sweet and feminine. Her signature crop top and choker lends a vintage vibe to this Chanel dress which is refreshing and keeps the look from being too innocent. Pair a lady-like midi skirt with a crop top and silk scarf for your next upscale outing. A dab of rosy lipstick enhances the romantic feel of the look. Staying stylish while flying is no easy feat. Lily-Rose shows us how it’s done with this casual yet put-together look. For an elevated take on the classic jeans and tee combo, pair a great pair of jeans (when it comes to denim, it is better to splurge than save), a buttery soft tank and a fitted hoodie. Finish off the look with comfy sneaks and a pair of cat eye sunnies to mask jet-lagged eyes. Simple, flattering and comfy – basically everything you want to achieve when it comes to airport attire. Every summer around late July, early August I find myself yearning for Autumn. This has especially been the case the last few weeks. As the temperature continues to rise, I can’t help but dream about brisk sunny days, crispy, sunset colored leaves, and cozy Fall clothes. I am regularly adding to my already extensive wardrobe but as I try to reduce clutter I am trying to approach shopping in a targeted way, searching for and buying what I need (and the odd thing that I don’t need but desperately want). As a little girl I used to love shopping with my mom. She would make a list and together we would head to the grocery store or mall. For me there has always been something satisfying about crossing things off lists. Whether its a “to-do” list or a shopping list, having a tangible, visual representation of getting things done has always brought me satisfaction. With this in mind I have curated a list of things that I need (and want) for the upcoming season.This list is a kind of fantasy with pieces from some of my favorite couture houses. It’s a dream shopping list if money were no object but with a focus on pieces that I actually need such as a sultry and simplistic silk slip dress and flawlessly cut leather cardigan. When it comes to my personal style I want to focus on creating an arsenal of exquisitely made classics. Items that are timeless and that will always look elegant and polished regardless of the place or occasion. There’s nothing I love more than to travel and go on vacation. To say I have a bad case of wanderlust would be an understatement. Travel broadens the mind, enriches the spirit and forces people to grow and learn in ways that you simply cannot with any number of books or any kind of formal education. Every summer I try to go on some sort of getaway, even if its within my own country (it’s amazing what one can discover by exploring their own backyard). I’ve traveled throughout Canada, the United States and Europe but I have never been anywhere tropical. Right now my fantasy vacation would be a trip to Tahiti where I would stay in a straw hut, swim every day, get my yoga on, meditate and fully relax. I must admit, despite my love for clothes and my extensive wardrobe, I am pretty much a professional when it comes to packing, and packing light. 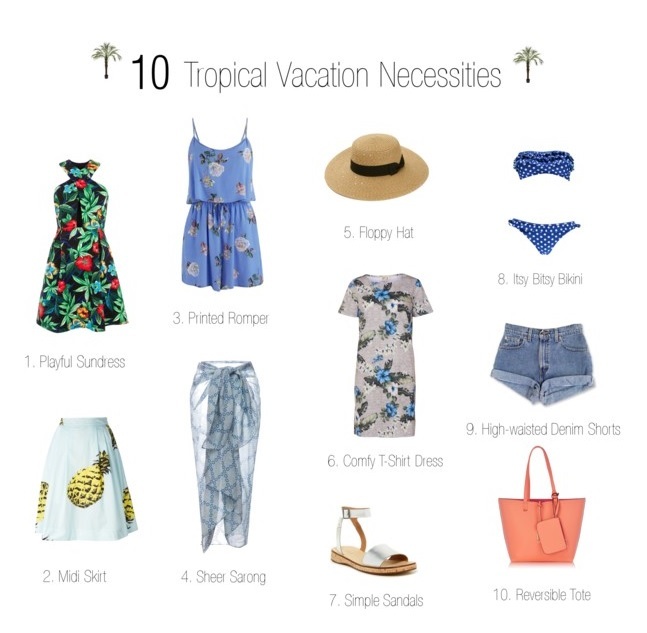 With this in mind I have curated a list of ten trendy (but not too trendy, I am a lover of clothes that are classic and elegant) items with a vintage feel that would infuse some retro, Tropical, Blue Hawaii-esque flair into any trip. Best accessorized with a beach and a pina colada.